The unspoiled vegetation or Flora in the Bhagwan Mahavir Sanctuary comprises of tropical and semi evergreen higher altitudes and river banks along with moist deciduous forest. The fauna comprises of herds of gaur, asiatic buffalo, monkey, elephants, leopard, sloth bear, giant squirrel, porcupine, civet cat, jungle fowl, tiger and black panther. The park is the den of king cobra, python, krait and many other reptiles. Nearly 220 species of birds can be seen in the sanctuary like Indian black woodpecker, the Malabar pied and great Indian horn bill, paradise Fly catcher, blue bird, wag tails, barbets, kingfishers, emerald dove, grey jungle fowl and many more can be sighted during bird watching in the Sanctuary. 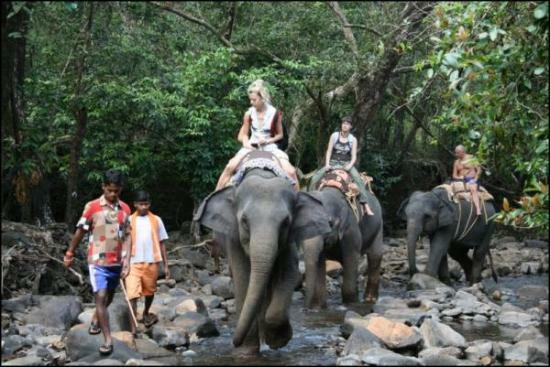 Entry permit can be obtained from the Range Forest Officer, Bhagwan Mahaveer Sanctuary, Mollem, Goa. Contact number (832)2612211. Entry fee for adult INR 20 children INR 5 and camera and vehicles and jeeps available for safaris are charged extra.